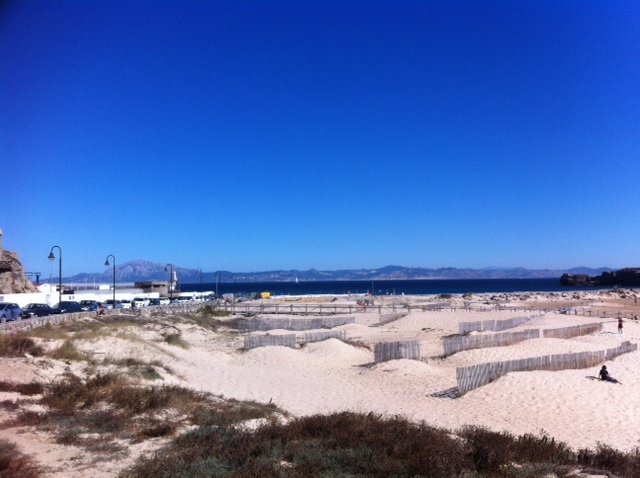 In the southernmost tip of Western Europe is a small beach resort town called Tarifa. Full of hostels, kite-boarding schools, bars, cafes and lots of dog-wielding retirees, it is a typical seaside town in the most classic of European traditions. Cheap drinks, lots of sand, pumping quasi-Ibizan beats in a handful of muscle-bound, cash-flashing young men-packed venues, it is roundly pleasant, reasonably quiet and a perfectly nice place to spend a night before ferrying across to Tangier. ADVERBS!!! I spent my last night in Europe passing the halfway point in Infinite Jest and drinking cheap Rioja, looking across the deep blue towards the blinking lights of a different continent. I even enjoyed a single cigarette, fitting in with the badass on the road traveller persona I’m currently inhabiting. I am. No matter what my behaviour indicates, I AM BADASS. The boat to Tangier is quick, swift, and revelatory. Packed and busy and loud, full of the varied fatigues, excitement and tensions of hundreds of people making a 9am inter-continental trip. Prepped, primed and ready to be hustled, I strutted forth from the ferry terminal, rejecting every offer of assistance with uncharacteristic aplomb. Once out the gate, however, a thin, withered, middle-aged man, teeth missing, yellow t-shirt, faded baby blue jeans, approached me, followed me, walked with me, as I told him more than once not to. I put a foot wrong, and once he had corrected me, I understood, resigned myself to the eventuality of having to pay him for navigational assistance. We entered the narrow streets of the Medina, the old town, and things got nastier. He set out to deliberately scare me. I collapsed inside, heart-racing, knees shaking, exhausted by carrying my backpack uphill and terrified about ever going outside again. I took every pill I could pull out of my bag discretely, was led to a table where other travellers were having breakfast, and tried to hide my shaking hands and proximity to a panic attack beneath repressed English silence. So, it’s fair to say, my initial experience of Morocco was not good. And as I calmed down (or whatever medication I’d ingested took effect), I engaged in conversation with some other people, and was invited to explore the Medina with a couple of American PhD Maths students. I did so. And as the day wore on and more people appeared on the streets, it changed. And my feelings of fear altered into feelings of excitement, as dark, deserted streets morphed into packed, vibrant shops and stalls selling cloth, spice, jewellery, ceramics, clothes; as the noise and the press and the atmosphere that seems to be making most of the other people I’m speaking to nervous became the norm, my fear lifted. My fear lifted as the atmosphere became more alien, became more Moroccan, became the “culture shock” that I had been anticipating, not the blunt monologue of violent threats I had instead been greeted with. 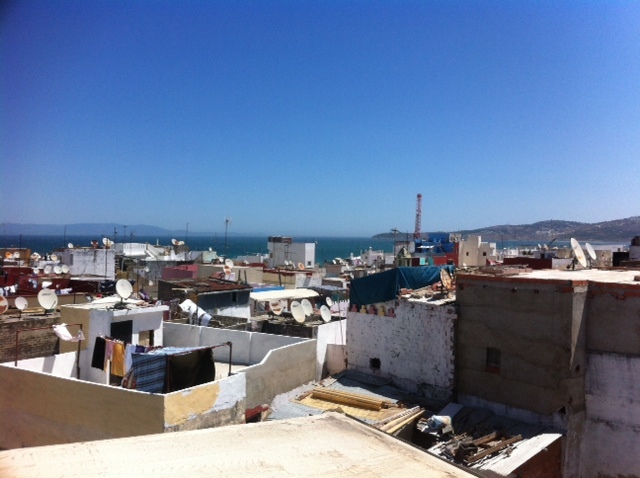 And since then, I’ve had an excellent time in Tangier. I’ve only spent time exploring with other people, and that has removed my phobias. There isn’t that much to do here. I visited the mythical Hercules’ Cave on the coast, I had some mint tea in Cafe Hafa (Paul Bowles’ old haunt) and I found (though couldn’t get inside) Hotel el-Muniria, where William S. Burroughs wrote Naked Lunch.